This vintage 1946 Bedford 28 seater single deck wedding bus is in immaculate condition and is great for all occasions, especially weddings and proms. 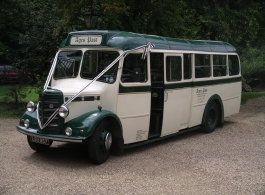 The vintage Bedfords are among the most popular and sought after buses for wedding hire as they are so unique and practical. Please note that there are a choice of up to 5 other Bedfords avaialble in Hampshire.